May 21, 2011 Stupid Award! Beware the Chicken Little False Prophets Who Proclaim the End of the World is Today! (Ver 1.1) I am on vacation in the mountains and I had not planned on posting anything this week. But, then a national news report came on about a religious zealot in California that I will not name today and he has predicted the end of the world to occur tomorrow at 6 PM Eastern Standard Time in the USA. When a man calls himself a Christian and then ignores the Bible to teach something so ridiculous that it makes national news it causes a negative perception to be reflected upon every Christian. One false prophet will cause every real prophet to look foolish. What if God had sent a prophet to Israel and Israel had already heard 12 other men who called themselves prophets say something that is opposite or different than the message from God? Doesn’t this make it easy to reject the real message? Sure it does! I did notice in the life of Elijah that he called down fire that consumed the other prophets and thus God got His message out in spite of the false prophets who attempted to corrupt the truth. 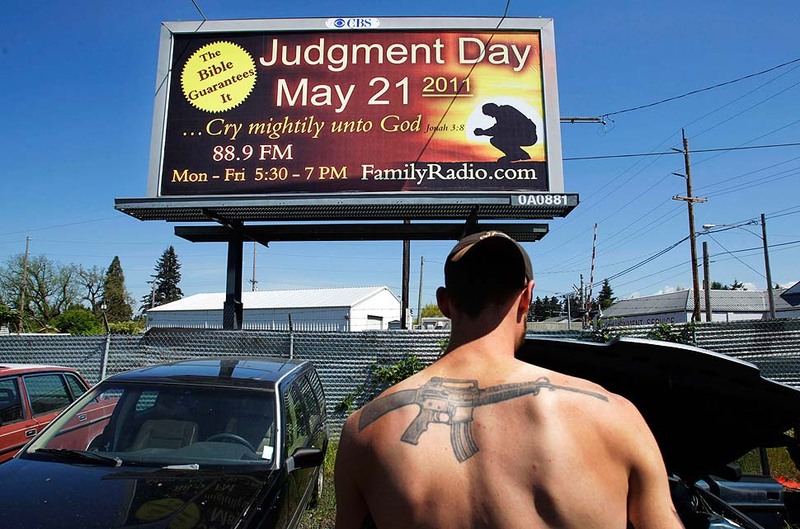 Well this man in California has supposedly studied the Bible for many years. He is not a young man and he has many followers who have quit their jobs to travel to tell everyone about the prediction. They have spent over a million dollars on billboards to warn the people of the earth. The late night comedians in the U.S. have made light of this prediction in countless jokes. Atheists are planning rapture parties for tomorrow at 6 PM to defy the message. People have even printed T-shirts to say how they survived the rapture. Christians are being mocked and ridiculed and are made to look like fools because of the foolish actions of a man who is clearly confused. When God gives someone revelation of His word, it is never going to contradict any other previous revelation of the Word of God to cause confusion. Real truth will always build upon truths that you already know. Therefore, we as Christians are forced to know the scripture for ourselves. This man who has predicted the end of the world tomorrow made a very similar prediction back in 1994. Since this prediction did not occur it is very easy to see that he is a false prophet. God never sent a man with the truth today and lies yesterday. A prophet of God will always speak the truth and what they say will occur. If you are following a man who has lied to you before then you are deceived. If you are following a man who contradicts another prophet of God or the written word of God you are deceived. This man claims his calculations were off in 1994, but he is absolutely convinced that he has not made a mistake about tomorrow. I wonder what he will think about his prediction on Sunday when nothing has happened. I wonder what his followers will think on Sunday. I know for sure what the world will think of his ignorant godless prophecy; they will laugh at him as they are doing right now. How can you follow a man who lies? How do I know that he is lying? It is simple, it because the greatest prophet Jesus Christ said this and I believe Him more than a fool who contradicts Him. Mat 24:36 But of that day and hour knoweth no man, no, not the angels of heaven, but my Father only. Jesus implies that He does not even know the day or the hour that He is returning to the earth. If Jesus does not know and the angels do not know, this includes Satan, Michael and Gabriel, how then can this man know more than Jesus and the angels? He must be the Father God to be able to predict the end. 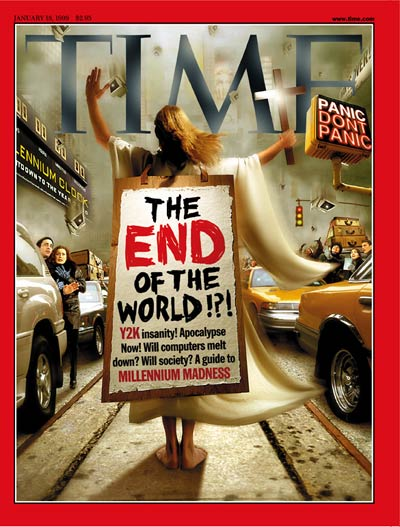 I do not care what revelation that you have found from the Bible, if you ignore the prophet Jesus to predict the end of the world you are a fool. Sorry I can be very blunt and direct sometimes. But, somebody needs to awaken Christians to see the real truth. If somebody doesn’t speak the truth, then everyone will follow fools who can say anything. If you are following a man who has set a date for the end of the world, you are the blind being led by the blind. So to the deceived people of the world who have predicted tomorrow to be the end, I do not criticize you personally (after all I did not name any names in this message), I do however reject your message. If the world ends tomorrow then I will look like a fool for countering your message. However, since I base my prediction on the Words of Jesus I feel very confident that the world will never end on any day that a man has predicted. I believe my God and not the words of just a man. I will pray for you that God may open the eyes of your understanding so that you are not deceived by false prophets. But to those who want to reject the Bible, the prophet Jesus and the truth to follow your fantasy, here is your 2011 Stupid Award. I hope you will learn your lesson and not make other Christians with real messages look like we are all as ignorant as you have portrayed yourself to be today. Make sure you are following the Word of God that you know and see in your own Bible and not the words of any man. I hope this message helped someone today. God Bless! Posted on May 20, 2011, in 2011 Stupid Awards, Stupid Awards and tagged Bible, Christianity, Church, God, Holy Spirit, Interpretation, lies, Prophecy, Religion, Revelation, Truth, understanding. Bookmark the permalink. 5 Comments. Jesus said decievers would come in the last days…The truly have! UMA MENSAGEM PARA OS PROFETAS DO FIM DO MUNDO. Já vem de longo tempo, desde que vários americanos do Norte, com os nomes de Milheiristas,ou adventistas; com nomes de seguidores do pastor Russel, e ainda mais tarde com o nome de testemunhas de Jeová, e outros americanos do Norte, com datas que só tem servido para confundir a humanidade. Veja as datas: 1843, ou 1844, para o fim do mundo. Estas duas datas foram anunciadas pelos adventistas, ou milherista, seguidores de Guilherme Miller,que foi um dos principais fundadores da mensagem adventista. Mas nada aconteceu. 1914 ou 1975, também o mundo ia se acabar, ou ia haver um fim do sistema de coisas como diz as chamadas testemunhas de Jeová que até em 1914,quando esperavam ir para o céu,assim que o mundo fosse destruído, ainda não se chamavam testemunhas de Jeová, porque foi só a partir de 1935 que passaram a se identificar como testemunhas de Jeová. Agora para 21 de maio de 2011, novamente tivemos as profecias da Family radio. Todas são interpretações errôneas dos americanos do Norte, que vem como uma avalanche ou enxurrada de ensinos falsos, para tomar o tempo das pessoas, dando uma data falida para o fim do mundo. Apesar de que Jesus disse quando esteve na terra,que ninguém sabe o dia ou a hora do fim do mundo;nem ele mesmo sabia,e nem os anjos mas,unicamente o pai. O homem natural, ou seja, os seminaristas não sabem nada espiritual, (1ºCor. 2:13-15;)muito menos a data do fim do mundo. Os homens só podem saber a data do fim do mundo, ou quaisquer outras coisas relacionadas com o reino de Deus, somente se Deus os revelar, porque Deus é a fonte do saber. Mas, todos estes falsos profetas da América do Norte, só se basearam em suas cronologias, seus calendários, e seus conhecimentos ao fazer montagens falsas, de profecias que não nada a ver com o que eles queriam nos incentivar a aceitar como verdades. É interessante notar que todos esses falsos profetas da América do Norte, se arriscam em dar duas datas para o fim do mundo. Os Milheiristas ou adventistas marcaram 1843, e 1844. O profeta da Family radio Haroldo Camping, marcou para o dia 6 de setembro de 1994,e depois mudou para 21 de maio de 2011,dizendo que neste dia,ia haver o maior terremoto de todos os tempos,e ia haver o julgamento Divino,e também o arrebatamento dos fiéis a Deus. Veja você, o erro que incorrem esses profetas. Guilherme Miller, e Carlos Fit, foram os principais profetas que anunciaram o fim do mundo para 1843, ou 22 outubro de 1844. 1914,foi outra data falsa,anunciada pelo falso profeta “Charles Tese Russel”,dizendo que o mundo ia se acabar nesta data,e só os seus adeptos iam ser levados para o céu.conforme está no livro deles “qualificado para ser ministro”pág.287.1975,foi outra fria que os adeptos da torre de vigia tiveram. Esperavam o fim do mundo, ou fim do sistema de coisa como dizem eles para esta data novamente. OS SERES HUMANOS EM SUA GANDE MAIORIA SÃO BURROS POR CAUSA DAS RELIGIÕES. Vejam a montagem dos Americanos do Norte. Filosofias adventistas. Daniel 8:v.14;diz:”Até duas mil e trezentas tardes e manhãs e o santuário será purificado.Até aqui os adventistas pensavam que o santuário a ser purificado era a terra.Por isso anunciavam que o mundo seria queimado com vinda de Cristo em 1843 ou 44. As duas mil trezentas tardes e manhãs que não era mais que 2300 sacrifícios que eram realizados pelas manhãs e pelas tardes no santuário terrestre,mas que foi maculado durante mil cento e cinqüenta dias,quando um rei de feroz catadura,obrigou os israelitas a sacrificar coisas imundas no santuário,nos sacrifícios das manhãs e das tardes,que era o sacrifício contínuo.Ex.29:39;Num.28:3,4;1ºCron.16:40;2ºCron.2:4;etc. Hoje,os adventistas aplicam Dan.8:14;de uma fora errônea,mas diferente do tempo em estavam esperando o fim do mundo em 1843 a 44. Se três tempos e meio são mil duzentos e sessenta dias, então,os sete tempos que o rei Nabucodonozor viveu como animal no campo são 2520 anos. Tudo isso são burrices das religiões que não recebem luz do alto,e ficam só na letra da bíblia. Os setes tempos que Nabucodonozor viveu com os animais são apenas sete anos e nada mais. Os sete tempos que era apenas sete anos que o Rei Nabucodonozor viveu com os animais,é interpretado pela torre de vigia,como sendo 2.520 anos. Então,Nabucodonozor viveu com os animais durante 2.520 anos. A burrice é tanta destes religiosos,que eles não tem tempo para pensar que nenhum homem viveu ao menos mil anos sobre a terra.É por isto que ficam enquadrados como falsos profetas. E dizendo que os sete dias que Noé esperava a chuva dentro da arca era sete mil anos. Então,Noé ficou dentro da arca esperando a chuva sete mil anos? ESTA É UMA MENSAGEM SÉRIA PARA OS PROFETAS DO FIM DO MUNDO. Thanks for taking the time to read and leave a comment from Portugal. God Bless you! Thank You for being a watchman on the wall looking out for the innocent and deceived!!!! THIS IS FOR THOSE WHO HAVE EARS TO HEAR WHAT THE SPIRIT IS SAYING UNTO US……PLEASE DON’T HARDENED YOUR HEARTS…..ASK JESUS FOR YOURSELF IF YOU’RE STILL NOT CONVINCED! Thanks for being a positive supporter with helpful words for others. God Bless!